I can’t remember a better summer for sports fans than this one. The NBA Playoffs were thrilling this year, baseball season is going strong, EURO 2012 has been a thrilling tournament so far, the London Olympics are not far off now, and tomorrow Wimbledon gets underway. A link out to the [email protected] Video Web page has been added. [email protected] presented by Mats Wilander and Annabel Croft, will provide all the colour of the Grounds, whilst bringing coverage of crucial moments from each of the most important matches. It is available to users only in the UK and the Americas (excluding Brazil), for the first year. The app’s main sections cover News, Live Scores, Results, Schedule and More – which includes player profiles, multimedia galleries, draws, Find It, and the new Live @ Wimbledon feature. 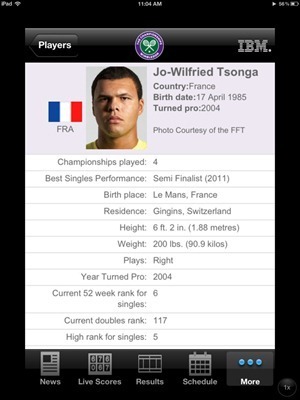 Just as an aside, Tsonga is my dark-horse pick for the Mens winner this year. I think if anyone can break through the Big 3 this year it might well be him. Here’s an App Store link for Wimbledon; it’s a free app.